Botanists at various times have recognised both these genera but it seems that most botanists at the present time regard them all as bulbophyllums. The main difference between the two groups is that most bulbophyllums carry single flowers while those once described as cirrhopetalums carry a number of flowers grouped together on a single stem in an arrangement called an umbel, in which the flowers are grouped together on one side of the arrangement like fingers on a hand. Bulbophyllum is a widely variable genus in many respects. 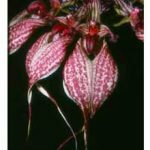 It includes some of the smallest species in the orchid world and some of the largest. These species are to be found in Africa, throughout India, Southeast Asia, the Philippines and Australia; one species is even found in New Zealand. Most require intermediate or warm conditions of culture but a few will grow under shade-house conditions in Melbourne. 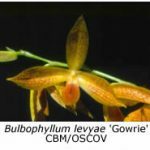 Over 1200 different species are now recognised, a vast increase on the 80 bulbophyllums and 20 cirrhopetalums known to exist in 1890, according to Veitch’s Manual of Orchidaceous Plants. 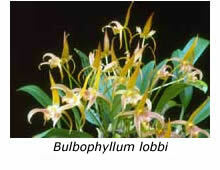 In Australia there are now 26 known bulbophyllums, all found in New South Wales and Queensland. They include B. globuliforme and B. minutissimum, contenders for the smallest orchids in the world; their pseudobulbs measure no more than 2 mm across! Over 600 different species are to be found in Papua New Guinea and many others throughout the warmer parts of Asia. One of the most attractive species, possibly the most widely grown, is B. lobbii. Its large flower, measuring up to 100 mm across, is carried singly on a stem about 150 mm tall. The colour varies from ochre to yellow with red or brown veins. 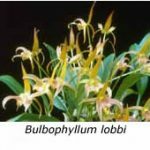 In common with virtually all bulbophyllums, its lip is delicately balanced so that it sways up and down in the gentlest breeze. It’s believed that this movement is designed to catch the attention of the flower’s pollinator, thus encouraging it to land. 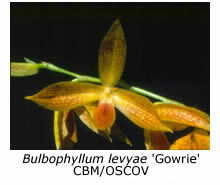 A widespread orchid, B. lobbii is found from north-east India to south-east Asia and the Philippines. Another widespread species, of the cirrhopetalum type, is B. longiflorum. It is found in northeast Queensland, Africa, Indonesia and Fiji, an enormous geographical range. 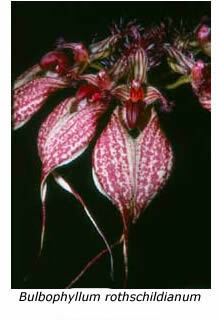 Its picture adorns the dust cover of Jones’ Native Orchids of Australia. I successfully grow and flower both this orchid and B. lobbii in my glasshouse, which is maintained at a minimum temperature of 12°C. However, this is the bare minimum and I’m sure both orchids would grow and flower better under warmer, more humid conditions. Two of the most unusual bulbophyllums that I grow are B. maximum and B. scaberulum, both natives of Africa and members of the section Megaclinium. B. maximum has unusual four-sided, scalloped pseudobulbs but the most unusual feature is the purplish rachis, shaped like a knife blade. This rachis bears two rows of tiny curved buds, one on each side, which open successively over a couple of months to produce tiny yellowish flowers bearing brown stripes. Each flower lasts only a week and then the next bud opens. The flowering stem and rachis of my plant, which flowers in summer, is only about 300 mm long but the flower stems of well grown plants of this species can reach a length of 900 mm. B. scaberulum is a similar species but its plant and rachis are smaller than those of B. maximum. Probably the largest of all bulbophyllums, insofar as its plant is concerned, is B. beccarii. Its pendant leaves can reach a length of 600 mm. However its flowers are only 10 mm across and they smell of rotten meat, so I would not recommend you try to grow this species. A year or two ago Bill Miles of Kingston flowered a newly imported plant of B. echinolabium. The long tails on the sepals of this species measure at least 250 mm from tip to tip, making it one of the largest-flowered species in the genus. It is rare and expensive. More readily obtainable species that I recommend are B. guttulatum and B. rothschildianum, both native to India. Each produces its flowers in an umbel, those of the latter species being especially attractive, although they last only a week in good condition. Both prefer intermediate conditions.